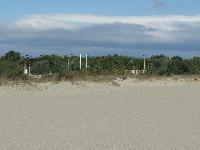 By the beach to the northern end of the Sainte Marie Plage but enclosed within the campsite wall. Not really suitable for large vehicles however we managed it at 8.5 mtrs and 3.4 mtrs high. From the D81 turn into Saite Marie Plage and go over the roundabouts until you arrive in front of the unusual looking Tourist Information Office, turn left and follow the road around to the left until you arrive at a roundabout take first exit and you are in front of the campsite entrance. Note: there are two campsites within 50 yds. Each pitch is marked out by various shrubs and trees that by end of season have taken over complete control of the site. There is a free wild parking area for up to 10 MH if you turn right at the tourist office and after approx 200 yds on the right. No services but close to harbour and you need to be there early in high season.